Every October, Florence Vincent launches a personal campaign to label foods that contain GMOs (genetically modified organisms). Although the U.S. government and the state of Washington have yet to join the 64 countries around the world* that mandate labeling, including Vietnam, Jordan, Sri Lanka and most of the European Union, for one month in one small corner of Yelm you can find out exactly what’s in your food. That corner? 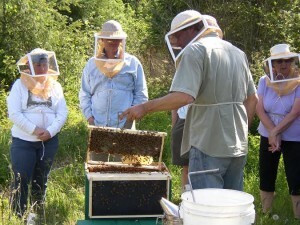 The Yelm Food Co-op. 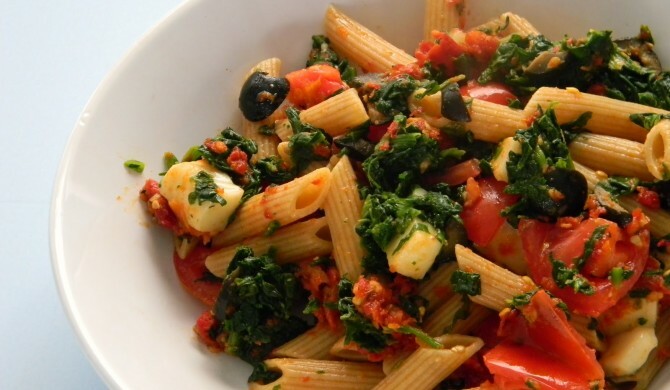 Florence’s passion for the subject arises out of her love of healthy, organic food. Back in her native England during the 1980’s, she helped a friend run the legendary Odette’s restaurant and eventually started her own – the first entirely organic establishment in the country, Elephants and Butterflies. “At the time there were vegetarian organic places, but none that also had organic meat,” she explains. After moving to America, she became involved with the Yelm Co-op just three months into its existence. “I just loved the concept,” she says. “I decided to volunteer to help. Because I’d had retail experience in my life, they jumped on it because nobody else had that.” Soon, she was asked to be manager and buyer, and for five years was the primary buyer for the store. The experience taught her something about herself. “Managing was not my strength; buying was my strength,” she says. “I love buying. I have always loved looked at new things, and tasting.” These days, she and General Manager Barnaby Urich Rintz travel to trade shows to try new products and bring back the best for Co-op customers. *To learn which countries mandate labeling GMO products, click here. Multiple choice question. Which best describes your feelings about sauerkraut? Whichever category you fall into, get ready for a new experience. 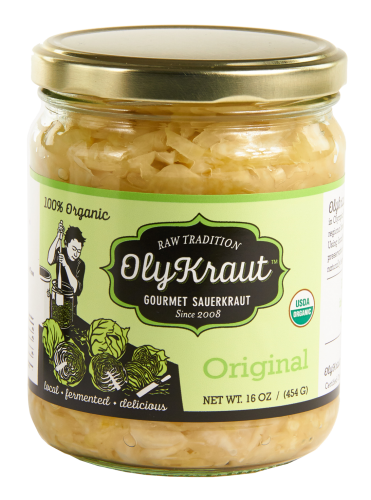 Olympia-based Olykraut has developed its own line of locally sourced, certified organic sauerkraut with year-round flavors like Spicy Garlic, Smoke & Kale and Eastern European. 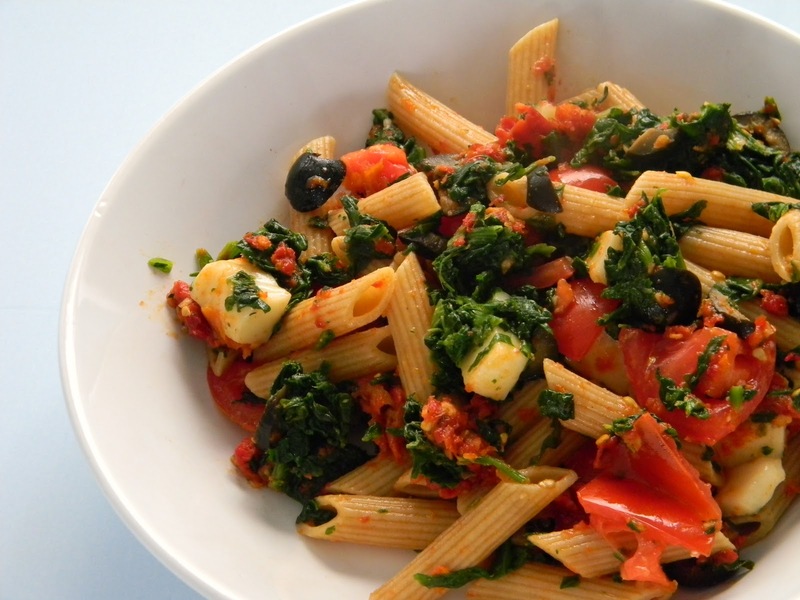 Additionally, they have seasonal flavors like Curry, Nettle, Sea Greens, and Cumin Jalapeno that are in high demand. “We get a lot of messages wondering when our seasonal flavors are going to be ready,” says Marketing and Communications Manager Carley Mattern. That’s not surprising, given the company’s origins. 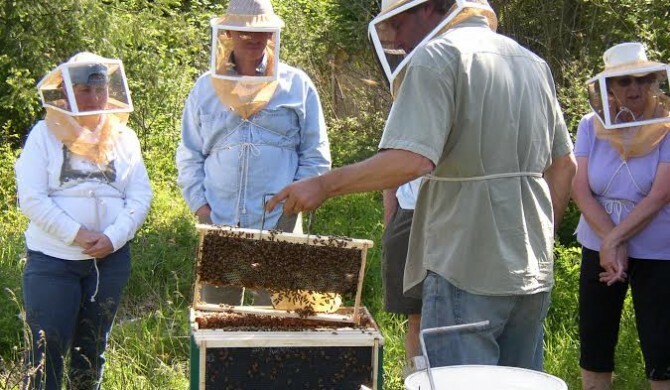 Sash Sunday, one of the founders, has an MBA in Sustainable Systems and studied Food, Fermentation and Sustainable Agriculture at the Evergreen State College. “Sash wants to get people excited about eating delicious and nutritious fermented foods,” says Mattern. Nutritious is right. 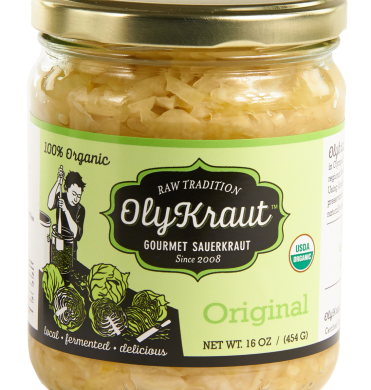 Sauerkraut functions as a natural probiotic and is rich in vitamin C, which is why in bygone days sailors, including Captain Cook, took it on long sea voyages to prevent scurvy. With the variety of flavors that Olykraut offers, eating healthy just got a little more appetizing. 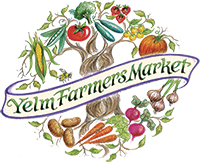 Olykraut products are available at the Yelm Food Cooperative in the refrigerator near the herbs and teas. Several weeks ago, Manager Debbie Burgan stated a goal: for more customers and members to shop first at the Co-op, and look elsewhere only if they couldn’t find what they were looking for. So how does that translate into regular meals for everyone from vegetarians to people who are new at trying to eat healthy? We asked chef Blu Helida to take a look at what the Co-op offers and consider the issue from a meal-planning perspective. Meat lovers who care about locally-sourced food can find pork sausage that goes well with Olykraut sauerkraut or whole chicken that can be roasted with vegetables. “They could also do curries, many different beef dishes or roasts,” she says. Those who are feeling more adventurous can find the ingredients for Asian chicken noodle soup, fajitas and a variety of other less common fare. Vegetarians also have a lot options. “They can use locally made sauces, dressings and salsa or buy fresh ingredients and make their own. If you’re looking for ways to add flavor or spice, there are plenty of choices for you to create your own fusion dish,” says Blu. We hope this encourages you to plan your next breakfasts, lunches and dinners with the Co-op in mind. Thank you Chef Blu! There you are, strolling the aisles of the Co-op and virtuously filling your cart with fruit, vegetables, and a few products whose names you can’t pronounce but they look healthy. Your intentions are good, your heart is pure – and then you get home. “If you’re like me, you buy all of these healthy foods but then the first thing to go is a bag of potato chips,”says Tish Watford. “Where we tend to break down a lot is in the snack department.” Her solution was to invent Sneaky’s, popcorn dusted with nutrient rich spirulina powder that is made of all organic, non-GMO, gluten-free ingredients. Tish’s first taste-testers were her parents. 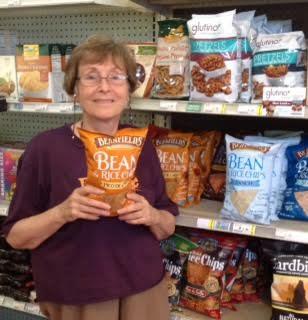 She was living in a small town in Alabama that didn’t really have any healthy food options. After a visit to neighboring Tuscaloosa, she brought home some spirulina. Her son wanted popcorn, so she decided to experiment with it. “It was a little salty at first,” she laughs. 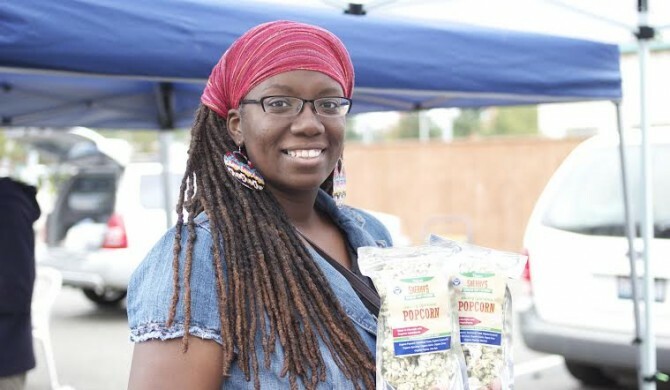 Since moving to Olympia, she’s perfected the product and introduced it into local health food stores, including the Yelm Food Co-op. Her next step is an alternative version of kettle corn “without the corn syrup,” she says. 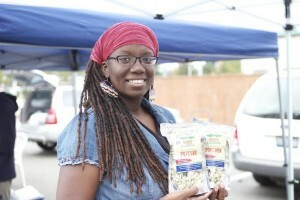 For now, look for spirulina Sneaky’s in the snack section of the Yelm Food Co-op. You can put it right next to your vegetables.